Many people think that eating healthy is complicated, overwhelming, expensive, etc. I was just talking about this subject with someone yesterday and find it can often be a barrier for many people. I try to encourage them, and those reading this, to see how simple it can be and why it really is cheaper. To briefly touch on it, the simplicity is knowing that whole foods and plants should be the focal point, whether you eat meat or not. Those are the foods, not processed foods, that you’re body knows what to do with and will give it what it needs. I like to look at expenses this way. Aside from the fact that it can actually be fairly cheap to buy whole foods, I’m going to spend money on food no matter what. I can either put my money into something that has no nutrients, no fiber, and causes inflammation, harm to the body, and eventually chronic diseases like heart disease, diabetes, arthritis… OR I can buy foods that are nutrient-dense, packed with fiber, vitamins, minerals, and antioxidants that are going to benefit my body. It’s continual, daily health care, where I will feel good, have energy, eat in abundance, and thrive. I love Lotus Foods brand of rices. They partner with small family farms in developing countries to provide a wide variety of sustainably grown, unique and heirloom rices. High quality, packed with nutrients, and delicious. Definitely check them out! I’m using their Heirloom Forbidden Rice here. It’s actually a deep purple color, which means antioxidants (yay! ), and is full of fiber, vitamins, minerals, and protein. Plus, it’s delicious! Stir fry vegetables with fresh ginger and garlic. I use a little coconut oil in there, too. In a bowl, mix together equal parts lemon and coconut aminos. Add just a touch of sweetener, enough to bring a little balance. If using miso, stir in desired amount, tasting as you add. Whisk in your arrowroot powder. Amount will vary depending liquid, but I generally use a small spoonful or so. Taste. Adjust to your liking. Add this sauce to your veggies in just the last few minutes on cooking. It should thicken slightly. Garnish with cilantro if desired. 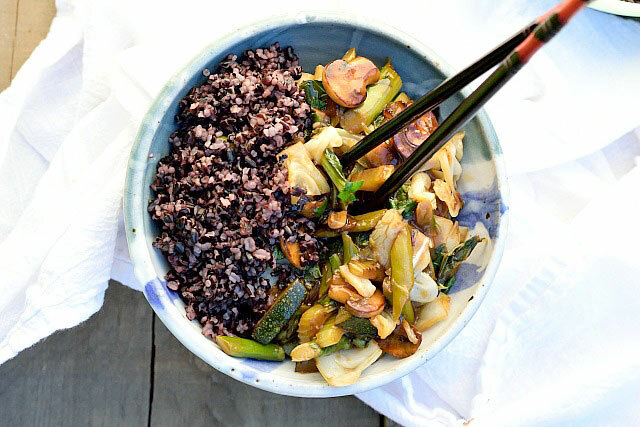 Enjoy this with your cooked rice, or a grain like quinoa or millet instead! 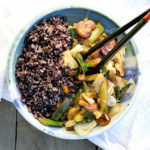 Stir fry with your vegetables of choice, my favorites are onions, mushrooms, green beans, asparagus, zucchini or yellow squash, and cabbage, and serve with rice or grain of choice!